Our playlist features all of the Rats' singles from the 1970s and 80s that reached the UK Top 40. 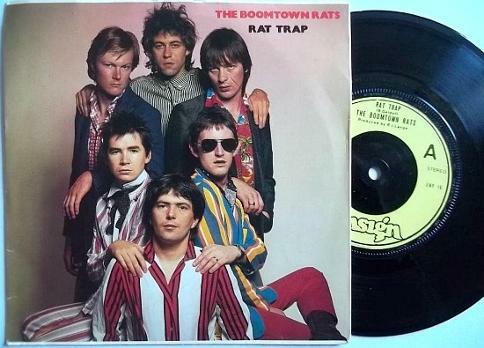 Boomtown Rats finest moment, I Don't Like Mondays, was a No.1 UK hit in 1979. I do have fond memories of putting this record on the Jukebox every time I went for a meal at a local pub with my parents. How I loved that single, and how I must have annoyed the landlord! When you listen to how this song has been constructed and produced, it feel kind of refreshing to hear such a quality tune again, especially after hearing the lame, underwhelming nonsense in the charts today. Bring back quality music, I say! Officially a 70s band, but still performing into the early 80s, The Boomtown Rats achieved a series of UK hits between 1977 and 1981. During the 80s, lead singer Bob Geldof became more famous for organising both the Live Aid concert and the Band Aid single "Do They Know It's Christmas" during 1985. All six members of the band were originally from Dun Laoghaire in Ireland. 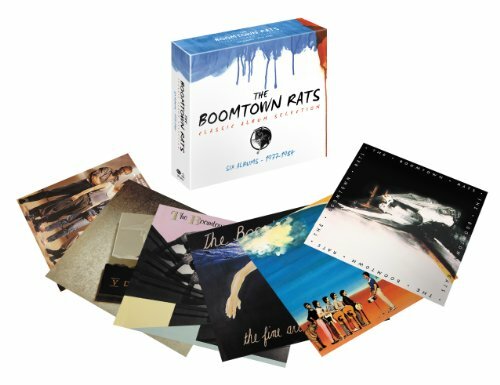 Where did they get the name "Boomtown Rats"? Well it comes comes from a gang in Woody Guthrie's autobiography Bound For Glory. Their biggest hits were I Don't Like Mondays and Rat Trap which both reached No.1 in the UK. Rat Trap was actually the first No.1 by an Irish rock band. Rat Trap spent two weeks at the top of the UK charty during November 1978. To celebrate the fact that the single knocked Summer Nights by John Travolta and Olivia Newton-John off the top spot (after 7 weeks), the band tore-up pictures of the duo at the start of their performance on Top of the Pops. Rat Trap was penned by Bob Geldof and refers to the depressing town that a boy called Billy feels trapped in. During the 80s the band started to lose favour with the public. However, in 1980 the lads were still at the peak of their career and the period 1977 to 1980 were Boomtown Rats golden years. 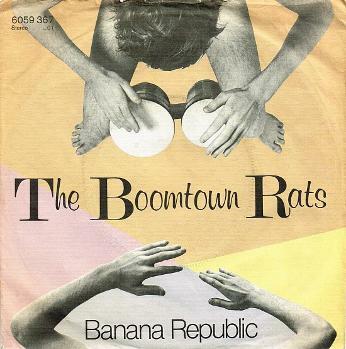 Banana Republic was a reggae/ska style tune and the first to be released from the album, Mondo Bongo. It reached number three in the UK charts, but was the band's last Top Ten single. 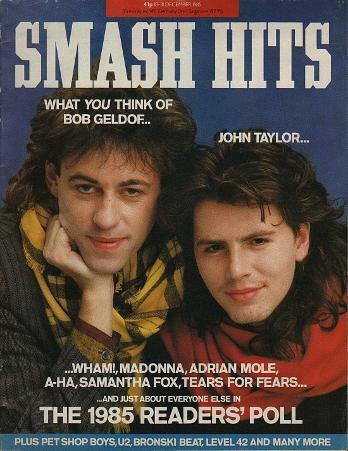 Bob Geldof and John Taylor from Duran Duran on the cover of Smash Hits magazine issue 18-31 Dec 1985.